Our current app collection, for iPad and iPhone, includes 8 tools for learning language alphabets. 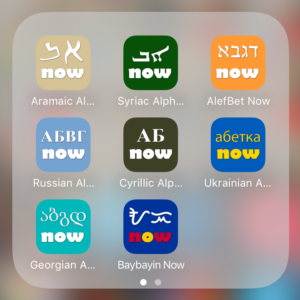 These include the scripts for Aramaic, Syriac, Hebrew, Cyrillic, Russian, Ukrainian, Georgian, Baybayin. We are also currently working on Greek, Rashi, Arabic and have a few other projects in mind. Watch this space! If there is a language script you are interested in and feel it would help to have a tool to learn it, send us a message, we will look into it.